Hand-painted driftwood signs made by one of the groom’s co-workers add whimsy to Ari and Suzanne Gray’s celebration. 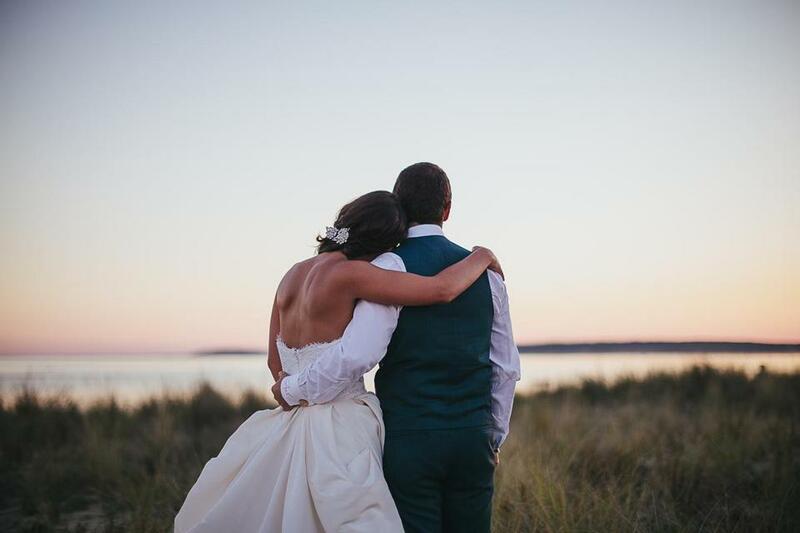 When Ari Gray and Suzanne Giovangelo began to search for a Cape Cod wedding venue, they had a clear vision for their day. 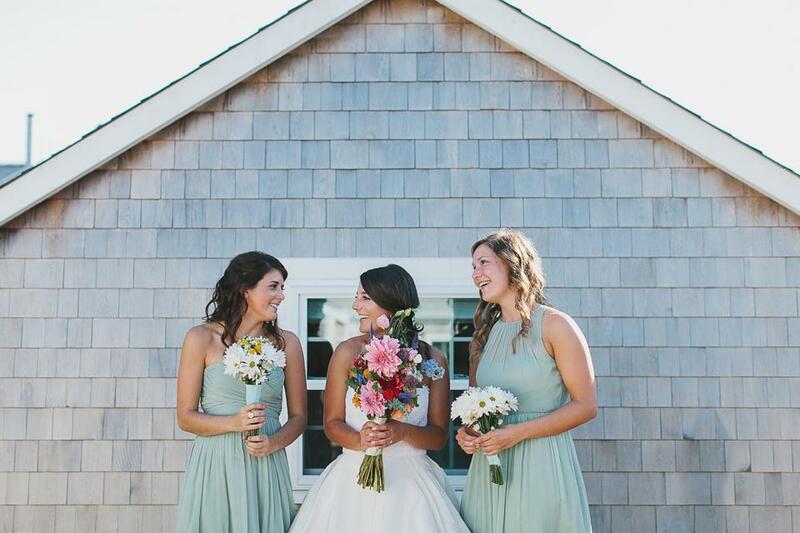 “We wanted a rustic beach wedding with gardens,” says the bride, now Suzanne Gray, who has always spent summer weekends in Wellfleet and loves gardening at the couple’s South Boston home. 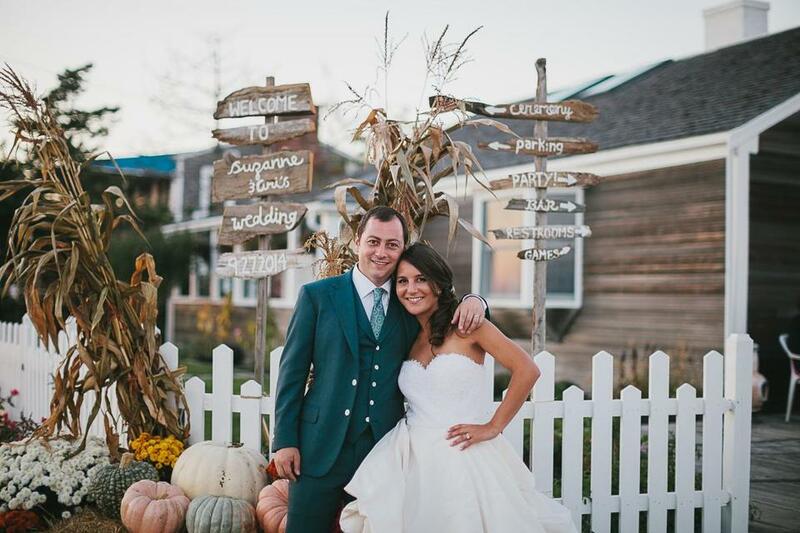 After touring several waterfront venues that didn’t feel right, Suzanne’s father, Joe Giovangelo, suggested they update the family’s Wellfleet cottage, add a garden, and host a wedding in the backyard. 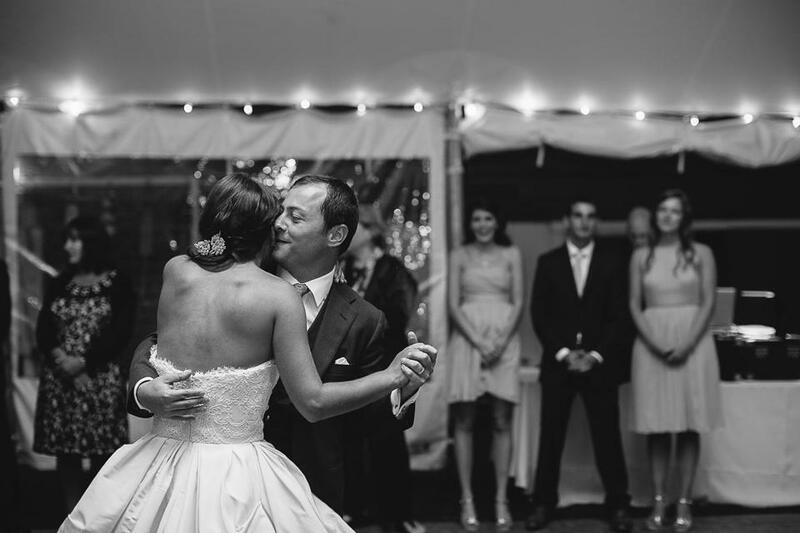 Ari and Suzanne met through mutual friends as sophomores at Babson College in Wellesley. When they began dating the following year, Ari often joined Suzanne and her family for weekends on the Cape; he fell in love with it, too. Seven years later, Ari proposed to a shocked Suzanne on a winter getaway weekend in Portland, Maine. 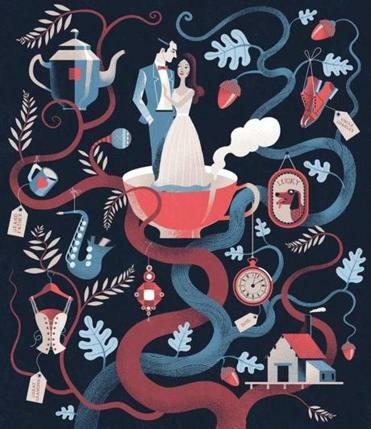 It would take them 18 months to prepare for their September 2014 wedding. Improvements on the four-bedroom cottage included a long-overdue makeover that involved painting and repairing the deck and driveway, among other tasks. 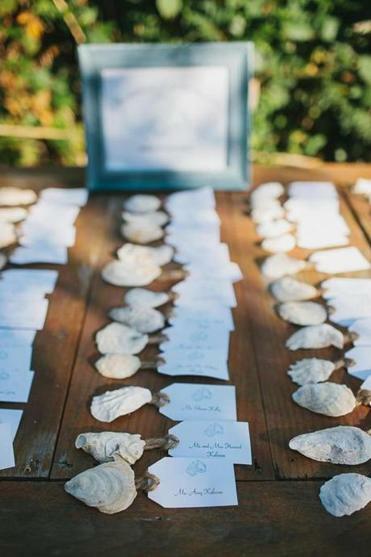 “It created a perfect opportunity to get the entire family working together on selected wedding preparation projects,” Joe says. Joe, his son, Steven (who would be Ari’s best man), and Ari did the bulk of the heavy rehab work, with friends and other family members helping out when needed. In their shoe-optional beach ceremony, the couple exchanged vows under a chuppah made of old fence posts. Suzanne’s favorite part was designing and planting 800 square feet of gardens abundant with shrubs, roses, grasses, and wildflowers, some of which were used in the centerpieces. The gardens reflected the breezy feel of the beach across the street, where they would exchange vows in a “very informal Jewish wedding,” as Ari describes it. “We wanted our guests to understand why we love Wellfleet so much,” says Suzanne, on drawing inspiration from the landscape. During afternoons spent clamming and oystering, they would save the shells to make salt and pepper cellars for the tables and weights for seating cards. Suzanne and her maid of honor found vintage oyster cans in an antiques store in Vermont and bought them all to use as vases. One of Ari’s colleagues created signs out of old clapboard and driftwood found on the beach. “Our friends and family were so supportive. They helped from start to finish and even got down in the dirt with us to garden,” says Suzanne. 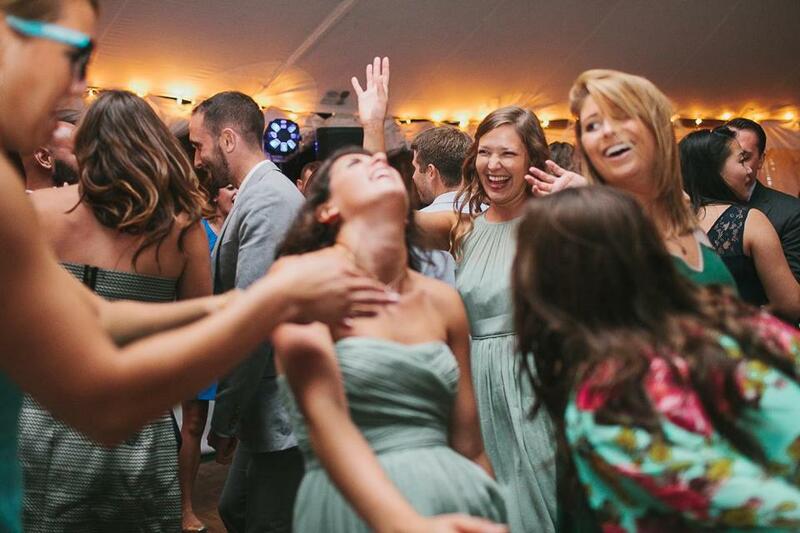 On the wedding day itself, the weather was practically custom-ordered: mid-70s and sunny. While Suzanne was getting ready nearby — she wore an Oscar de la Renta gown purchased at Vows in Watertown — Ari hit the water with their friends, many of whom had been his teammates on the Babson College swim team. In the shoe-optional ceremony on Mayo Beach, the couple walked down the aisle to steel-drum music provided by Michael Gabriel. Their Boston terrier Pippy served as the ring bearer, gamely sporting a pillow their tailor had made from leftover wedding dress material. The couple exchanged vows under a chuppah fashioned from old fence posts. Afterward, Suzanne and Ari stole away to a favorite spot known as Uncle Tim’s Bridge for photos and a few minutes of calm. 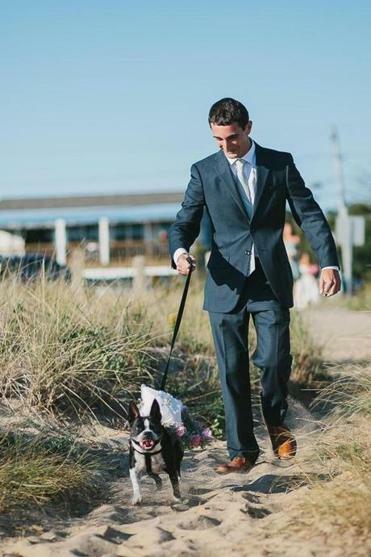 The couple’s Boston terrier Pippy serves as ring bearer. To create even more laughs and capture the day in a nontraditional way, Ari built a DIY iPad photo booth in the outdoor shower. The couple added a few accoutrements for dressing up. The clapboard sign read: Grab a prop. Strike a pose. Make a memory. Suzanne planted 800 square feet of gardens for her big day, and florist Tara Cappello used some of the flowers for the bridal bouquet and decor. The bride’s gown came from Vows in Watertown, the attendants’ from J.Crew. 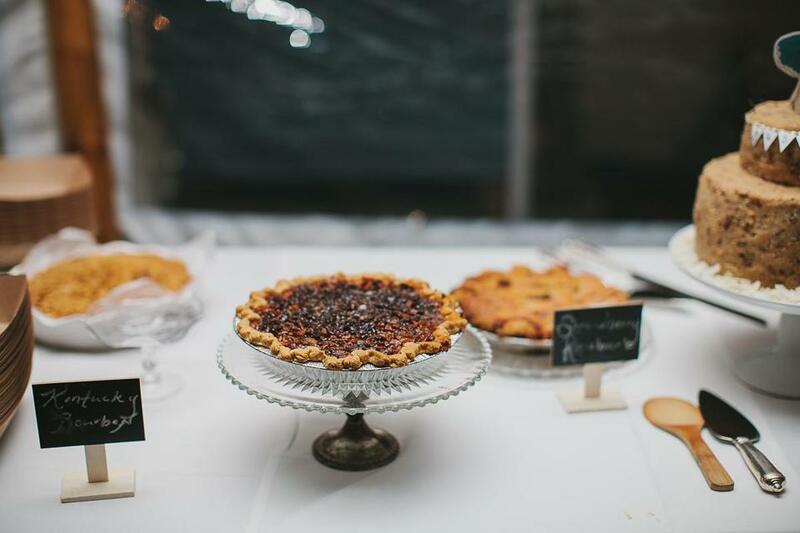 Pies for the reception came from The Merc in Dennis Village. 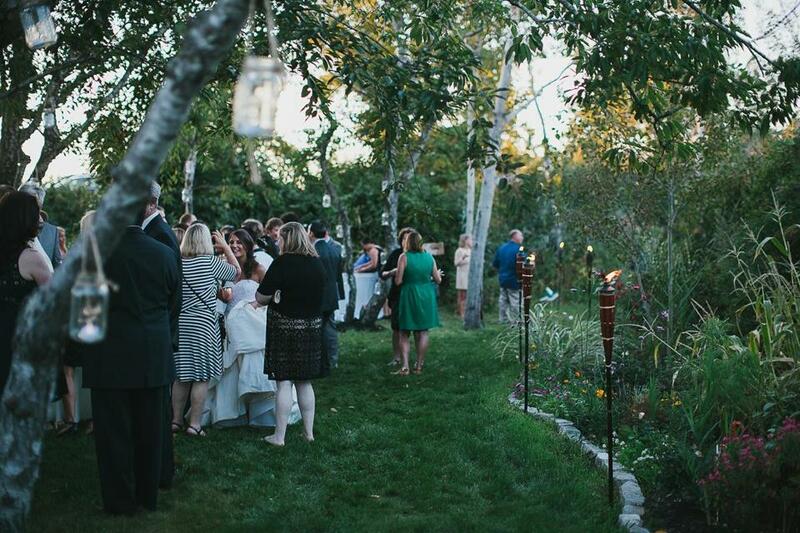 A backyard tent hosts 130 guests for dinner and dancing. 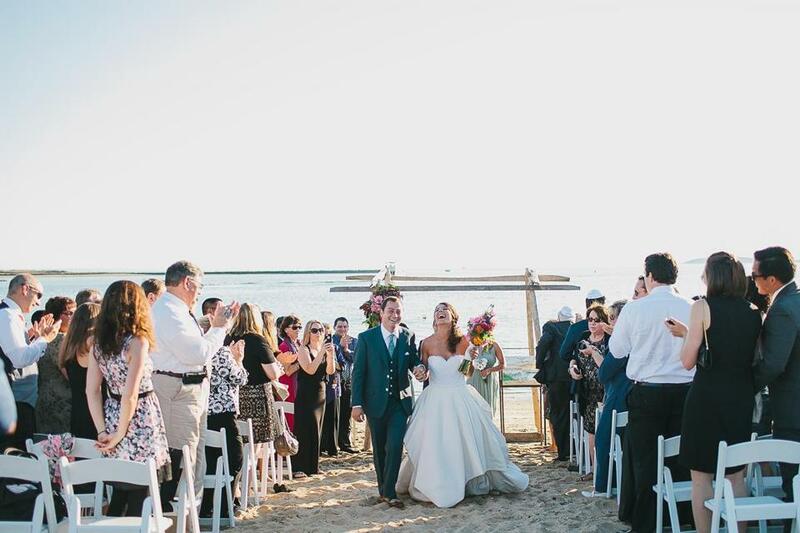 “It was always in my head that if we’re inviting 130 guests to a beach wedding, we want to show them a good time,” says Ari, who works in sales. Sandra A. Miller is a local writer and teacher. Send comments to magazine@globe.com.